co-presented by Anne Benvenuti Ph.D., Elizabeth Davenport Ph.D., and Glenys Livingstone Ph.D.. This workshop will focus on the intersection of religious practice and neuroscience research. Participants will learn how neuro networks in the brain relate to spiritual practice. The presenters will use experiential exercises and structured responses to illustrate the types of neurointegration related to spiritual practice. They will also present an overview of related neuroscience research and its implications for religious practice and will apply it to specific examples of religious practice from Indigenous, Eastern, and Western traditions. The global panel of presenters, from Pagan, Buddhist and Christian traditions, will also discuss the importance of listening to one another, especially as it relates to the healing of the earth. The workshop will emphasise spiritual practise as something that awakens us to the idea that we are all ‘co-beings’ with others, with the natural world, and with the transcendent. Anne Benvenuti, PhD, is Professor of Philosophy and Psychology at Cerro Coso College, California, and Visiting Scholar at University of Chicago Divinity School and Georgetown University Medical School, Systems Medicine. A licensed psychologist trained in mind/body medicine, she has published on science and religion and is working on models of religious accountability. Benvenuti has personal experience over many years in three traditions: Buddhism, Christianity and Shamanism. She is also a naturalist and published poet. Elizabeth Davenport , PhD, is Dean of Rockefeller Chapel at the University of Chicago. She oversees religious life at the university, working with students, faculty and community leaders of all traditions. A native of England, she has a strong connection to Indigenous Celtic traditions and is ordained in the Anglican/Episcopal tradition. She holds BA and MA degrees in theology from Oxford University and a PhD in Religion and Social Ethics from the University of Southern California. Glenys Livingstone PhD in Social Ecology, and an MA in Theology and Philosophy. She has Australian country roots and has trained as a teacher. Dr Livingstone has been academically and culturally involved in the resurgence of female sacred imagery for over thirty years. She is a celebrant of the annual seasonal rituals and author of ‘PaGaian Cosmology’. She lives in the Blue Mountains with her partner Taffy Seaborne. Below is the portion presented by Glenys Livingstone. This altar/mandala which is representative of my work PaGaian Cosmology: Re-inventing Earth-based Goddess Religion, was laid out in the centre front on a large platform. THE RITUAL: I’d like to share with you a simple ritual that gives you a taste if you like, of my practice, and it is also at the same time an acknowledgement of this particular Place and Time, and all who have come before us Here. Please join me in this contemplation. 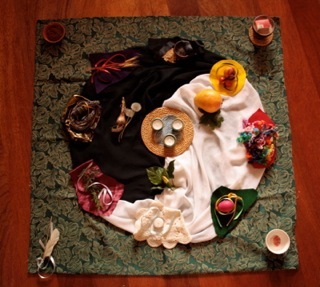 This altar/mandala represents for me a template of wholeness … which the Universe must be. I have been prepared to trust myself to this template – because it seemed to me to be so basic to Earth and Sun and Cosmos – our Place of being, our Habitat . I have come to represent this template in a three-layered arrangement – a mandala, a pattern which has inscribed itself within me through my conscious practice of its story and rhythm, in my place on the planet. At the edges of this particular mandala are the four elements in four directions – Water, Fire, Earth, Air. These are things I can identify as held in common to all being on this planet, and Their sensate presence can be felt within any being . You may feel the Water in you, this primordial ocean recycled many times – its moistness, taste it in you, this ancient Water. You may feel the Fire in you, this ancient heat passed on – its warmth. Feel its warmth in you. You may feel the Earth in you, this geological formation– its weight, feel your weight – this Earth in you. You may feel the Air in you – its expansion – this ancient river that all have breathed. Feel this Air expand in you. Within that boundary is a circle formed by eight objects, representing the eight seasonal points that I and many others have celebrated in recognition of the regional phases of our planet’s relationship with our source of energy and life, the Sun . The centre of the arrangement is formed by three candles and associated objects which represent the Triple Spiral, the three faces of the Metaphor for the Creative Dynamic that I perceive continually unfolds it all . She is the Old One – Who creates the Space to Be – the deep sentience within all. She is the Young One/Maiden – Who is the Urge to Be – the new continually emerging. We may remember something of what it has taken to unfold this present Moment and Place for each of us – the work/creativity of the ancestors – of the ages and of recent times, the people of this Land – particularly the local ones of this region, the creatures and plants of all times and places, the Land Herself. We are thankful to All – present in the Depth of this Moment and Place. I grew up in country Queensland Australia. I consider myself a student of the Poetry of the Universe – a language expressed in scientific story, mythological metaphor, ancient and contemporary images of integrity, body movement and dance, stillness, chants and songs. By these means I have conducted “geo-therapy” – ecological reconnection – for myself and others. I have been changing my mind, “situating”myself. this image has been unfolding itself to me – as I practiced Her rituals and studied the Triple Goddess. – dated at 2400 B.C.E., inscribed by the ancestors of many here – on the inner chamber wall at “Newgrange” in Ireland, … Bru na Boinne – place of Boann. This image is lit up at the moment of Winter Solstice dawn, the annual seasonal point that traditionally celebrates the Birth of Light and Form – the coming into Being. The Triple Spiral may be understood to represent something of the Indigenous tradition of the Place. This image has only recently been re-discovered after millennia of being covered, and its significance to the indigenous people of the Place re-imagined. I feel that it represents the essence of my practice and heritage. It has been suggested by scholars that the Triple Spiral represents the Triple Goddess.The mind required for the real comprehension of art and monument from this period and place is one that allows the goddess functions beyond the ornamental. That mind has been hard to come by until recently. The work of Marija Gimbutas has been notable in this regard. She notes the extensive use – all across Old Europe – of the “tri-line”, appearing as early as 24,000 B.C.E. (1991:89). She notes its later association with energy symbols of “beginning” and “becoming”. (1991:92-94). Gimbutas notes the link of this motif with the Triple Goddess, “an astonishingly long-lived image” documented as early as 15,000 B.C.E. … continuous down to the Triple Matrons of many cultures (1991:97). 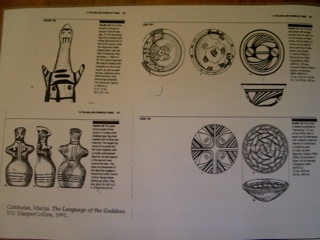 TRIPLE GODDESS IMAGES (Lawrence Durdin-Robertson 1990:35 and 114. Adele Getty 1990:87). Researchers are now realizing that the Triple Spiral was inscribed by minds that understood their Place – Earth and Cosmos – as Goddess-Creator: that is, that this Place itself IS the Sacred Entity, the Deity. For these ancestors, the Land itself was Mother Deity – and in our times the sense of this LAND/country has been extended – to the Universe: that is, the Pagan/indigenous person – as one who dwells in the “Country”, may become PaGaian – as our sense of “country”, our sense of Gaia, is extended to a huge universe backyard. The Land Herself, the Cosmos, as my forbears knew Her, was the dynamic source of life – as any of us may know Her too. And for these, She was triple-faced – there was the aspect of Mother – the whole, the aspect of the Virgin/Young One – the differentiated individual parts, and the aspect of the Crone – the hidden sentience within. I have also associated these three aspects with the three Refuges of Buddhism:- Sangha with the Mother, Buddha with Virgin, and Dharma with Crone. This ubiquitous Triple-faced Creative Dynamic is most likely Lunar in its original representation – as humans have witnessed the Moon waxing into fullness, and waning into darkness, and re-emerging. The Moon was the original story of descent and return (See Baring and Cashford 2003). The Moon Goddess one of the earliest of Deities. 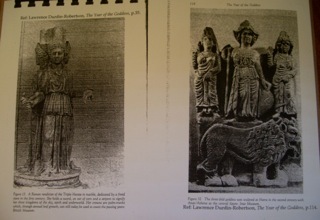 The earliest story humans have of descent and return is that of Inanna, and later Persephone – well before the gods. 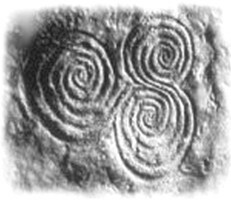 Humans have for a long time identified a Creative Triplicity that runs through every part of the Universe.The Celts knew the triple form as the Triskele – a triple-limbed wheel “that encompasses the beginning, middle and end of everything” (ibid). It is also embodied in every breath – as it waxes, peaks and wanes – as all Being does. Virgin – the Urge to Be – felt in the beginning of the breath. This is the budding of new leaves, the first sliver of the new Moon. Your tentative new beginnings- at any time in your life. Mother – the Place of Being – felt in the peaking of the breath – the reciprocal interchange. This is the fullness of the flower, the ripeness of the fruit, the fullness of Moon. Your creative engagement peaking. Crone – the creating of Space to Be – felt in the release of the breath. This is the seed pod forming, the grinding of the ripe grain, the waxing Dark of the Moon. Your letting go of your achievements, your small self – dissolving into Larger Self … the constant dissolving. Differentiation – to be is to be unique … it is the Universe’s “outrageous bias for the novel” (Swimme and Berry p.74) – relates to the Virgin aspect. It is the love of Self, the particular. Communion – to be is to be related … “… the primal togetherness of things” (p. 78) – relates to the Mother aspect. It is the love of Other, the web of interaction. Autopoeisis – to be is to be a centre of creativity … “the interior dimension of things … the power each thing has to participate directly in the cosmos-creating endeavour.” (p.75) – relates to the Crone/Old One aspect. It is love of All-That-Is, the Larger Self. Durdin-Robertson, Lawrence. The Year of the Goddess . Wellingborough: Aquarian Press, 1990. Getty, Adele. Goddess: Mother of Living Nature London: Thames and Hudson, 1990.